You may have heard about the caravan of immigrants from Central America making its way through Mexico in the hopes of illegally crossing the border into the United States. The group of perhaps 4,000 to 7,000 people has made its intentions clear: entering the U.S., even if it means violating American immigration laws. But you may not have heard of one of the key organizers behind the caravan: Pueblo Sin Fronteras, or “People Without Borders.” And Pueblo Sin Fronteras wants to keep it that way. 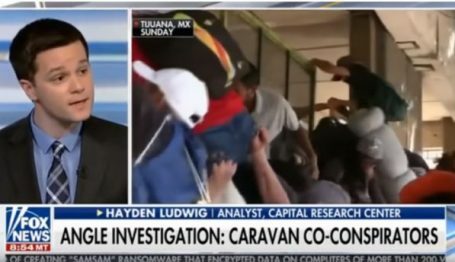 Some left-leaning publications such as the New York Times have said that “no group has claimed responsibility for organizing [the most recent] caravan,” perhaps in order to stave off claims by President Trump and other conservatives that it is being aided by left-wing activists in the United States. The Times, however, is only partially correct. While no single group has claimed control of the migrant caravan, at least two activists from Pueblo Sin Fronteras—Denis Omar Contreras and Rodrigo Abeja—are embedded in the caravan, according to the Los Angeles Times, the Washington Post, and the Mexican newspaper La Jornada. Contreras (sometimes spelled Contera or Contrera) reportedly helped lead the caravan to illegally enter Mexico, where he told migrants “Welcome to Tapachula!” (referencing a town near the Guatemala border). 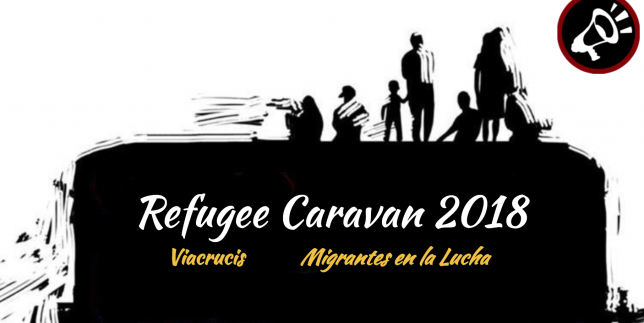 Abeja, too, was identified as one of the leaders of the April 2018 caravans, which were also supported by Pueblo Sin Fronteras. On October 18, Irineo Mujica—director of Pueblo Sin Fronteras in Mexico and an American citizen—was arrested by Mexican officials for allegedly attacking immigration officials at a pro-illegal immigration protest near the Guatemala-Mexico border. It’s time the Guatemalan government stand up for its Honduran brothers and sisters. The people who are currently fleeing Honduras are being forcibly displaced from their country . . . and that is a direct result of the corrupt Honduran government and U.S. intervention and support for that corrupt government. But who is Pueblo Sin Fronteras, anyway? The group appears to be a remnant of the now-defunct 501(c)(4) La Familia Latina Unida (“The United Latin Family”), a Chicago, Illinois-based illegal immigration advocacy group formed in 2001 by illegal immigrant and activist Elvira Arellano. The two groups are regularly listed side-by-side with each other and have overlapping staff. The groups claim to have organized approximately 1,000 economic migrants from Central America to cross the U.S. and Mexican borders illegally since 2010 (prior to most of the caravans). They also share the same Chicago address (2716 W. Division St., Chicago, Illinois, 60622), which is also the same address as the Adalberto Methodist Church in which Arellano once hid from U.S. immigration authorities prior to founding La Familia Latina Unida. Although La Familia Latina Unida had its IRS tax exemption revoked in May 2017 for failing to file a Form 990 tax return for three consecutive years, the Illinois Secretary of State’s website lists the group as currently active. (Its tax-exempt status is currently unknown.) Regardless, Pueblo Sin Fronteras’s efforts continue with the aid of a third organization: the Centro Sin Fronteras (“Center Without Borders”), a 501(c)(3) illegal immigration organizing group headquartered in the Lincoln United Methodist Church in Chicago. The Center is headed by Emma Lozano and her husband, Walter “Slim” Coleman, who founded the group in 1987 following the murder of Lozano’s brother, left-wing community organizer Rudy Lozano. It has called for a “moratorium on all raids” by immigration authorities, comprehensive immigration reform “that provides legalization for the 12 million” illegal immigrants in the country, and a “renegotiation of NAFTA and other trade and financial agreements” to better suit the interests of Mexico. Lozano is a member of the League of United Latin American Citizens (LULAC), and has coordinated events with LULAC at Lincoln United Methodist Church. Cecilia Garcia, president of the Chicago-based LULAC Council 5311, is also on the Center’s board of directors. Lozano is also an activist for so-called DREAMers—children of illegal immigrants to the U.S. protected by the Obama-era executive order commonly referred to as the “DREAM Act.” In 2014, Pueblo Sin Fronteras claimed it had “helped 400 first time applicants and 200 renewal applicants apply/reapply for DACA” (the Deferred Action for Childhood Arrivals executive program) with a “100 percent success rate.” That applicant workshop was held at Lozano’s Lincoln United Methodist Church, a hotspot for illegal immigration activism. Financially, El Centro Sin Fronteras is small, with just under $34,000 in revenue and about $35,000 in expenditures in 2016. Much of its funding from 2000-2005 came from the Public Welfare Foundation, a major left-wing foundation that also funds far-left groups like the Southern Poverty Law Center and Alliance for Global Justice. In 2010, the National Immigration Forum reported giving $60,000 to the Center. The Forum, in turn, receives funding from a number of major left-wing grantmaking foundations, including the MacArthur, Ford, and Rockefeller Foundations. Much more disturbing is how brazenly all three groups—La Familia Latina Unida, Pueblo Sin Fronteras, and Centro Sin Fronteras—use the Lincoln United Methodist Church as a rallying point for illegal immigration activism, using a tax-exempt church as cover to advocate for foreign violation of our country’s border laws. If the string of caravans it’s helped organize in 2018 reveals anything, it’s that Pueblo Sin Fronteras’s influence—and its threat to America’s immigration laws—far outstrips its pocketbook.